Last year I reviewed the debut offering from Lym Audio, a simple but effective Tripath based two input integrated amplifier. In the introduction to that review I marvelled at the bravery of the manufacturer, launching such a device into a crowded market, somewhat expecting it to disappear without trace despite its quality. Far from it. 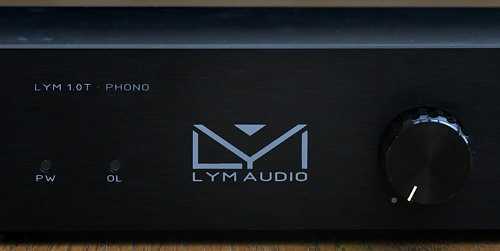 Results from the original launch must have been encouraging as Lym Audio has now launched a derivative of the Lym 1.0 featuring some engineering improvements and, most significantly, integrating a phono preamp on one channel to allow the amplifier to be used with a record deck without the need for a separate phono preamplifier. The Lym 1.0 T Phono is a small stereo integrated amplifier. One channel is for line level inputs, the other for a moving magnet phono cartridge. The front panel has a simple volume control, which also acts as an on/off switch, and a two way channel selector switch. Two small lamps indicate power on and overload. I mentioned the overload indication positively in the last review as it is important not to drive this amplifier too hard to retain quality. On the back are the two RCA inuts, a pair of speaker outputs, an input for the laptop style external power adapter (a 30 euro cost option) and a grounding terminal to enable earthing of the phono cartridge (if this is offered by the deck). The basic specification is the same as the regular 1.0T. Power output at 8ohms is 10.4W, rising to 17W at 4ohm. 11.5 W will be delivered cleanly into 4ohms after which distortion rapidly sets in. In practice this is a low power amplifier capable of 8 watt of clean power into typical 8 ohm speakers. The chip which does the amplification is a TA2024C. The amplification benefits from a slight increase in the voltage sent to the chip from 13.8 to 14 volt. Frequency performance is not specified by the manufacturer but judging by the previous model will be pretty flat. 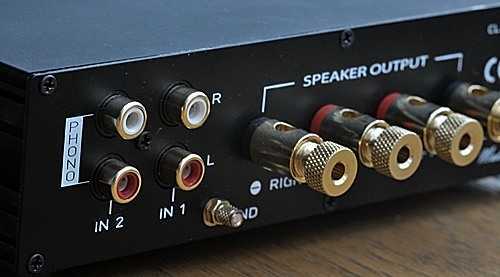 Internally the phono module consists of two sections – op amps (and their associated power supply) and the RIAA equalization circuit. The op amps are National Semiconductor LME49860 devices which offer very low noise and distortion performance (harmonic distortion in the chip is just 0.00003%!) . The RIAA circuit is passive (without feedback). The Lym supports moving magnet cartridges only as the level of gain is not adequate for low output moving coils. Matteo from Lym is especially pleased with the effect of improving the coils used in the output filter of the line only version to components made by WURTH which have a higher degree of electromagnetic shielding. Since this amp is likely to spend its life close to computers and these radiate all kinds of electromagnetic rubbish then the extra shielding is most welcome. Not much to say here that's not covered by the previous review. In summary, the unit is small (19cm wide x 10cm front to back (excluding terminals) x 5.5 cm deep) in a fairly sturdy metal case with an aluminium front. The casing is quite basic - this is not hi-fi jewellery - but it's perfectly adequate. As with the previous version it does have a tendency to be pulled down and backwards by the speaker cables. The terminals themselves are a decent screw type that will take banana plugs, spades or bare wires. The review version came in black, it's also available in silver. 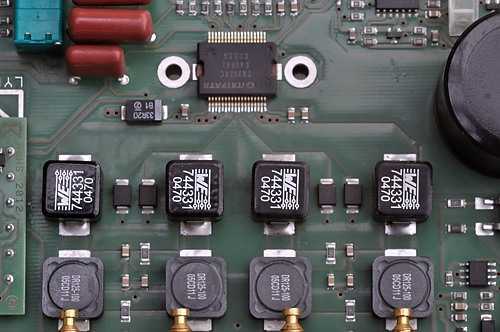 Internally it uses a two level PCB, the lower of which provides the extra level of electromagnetic shielding. The PCB layout is very neat and the interior looks well finished. I hooked up the Lym to my Acoustic Energy speakers because they are quite sensitive and I use them in a small room. Fed from a Cambridge Audio DACMagic they seemed to welcome back the little Italian amplifier. I had been using a big Musical Fidelity amp – overkill in the space but a decent performer. But the Lym straight away delivered both more clarity and presence. There's something about a well designed Tripath amp (into suitably sensitive speakers) that delivers a more human sound to my ears than most alternatives. The Lym has a warmth that has nothing to do with valve softness together with an accuracy that suits high definition sources. So I started playing some music! I'm a bit of a fan of American female singer songwriters after growing up on Joni Mitchell and Rickie Lee Jones. Meg Hutchinson is a recent favourite with sweet acoustic guitar and subtle but strong arrangements on the 2008 album, "Come Up Full". Listening with the Lym I was struck by the freedom of the soundstage from the speakers, the sparkle of the guitars and the strength of the bass. Meg's breathy, closely recorded vocals floated in space whilst the sound remained coherent and musical. The amp made its full contribution to the intimacy of the sound. I had the chance to do a direct comparison between the old and new models. I just about preferred the sound of the new version although the differences were small. Maybe the new model had slightly better bass control and a slightly more open sound. The soundstage seemed a little more stable. They were pretty much too close to call, particularly given the difficulty of doing an A/B comparison between amplifiers and a single pair of speakers - having to change cables between amps. I was able to conclude that the line stage was at least as good as the original and maybe fractionally better. Which brings us to the phono stage which is the raison d'etre for the new model. It was difficult to know what to test this against. I am not aware of any direct competitors in the "Tripath based phono and line integrated amp" category - and I certainly didn't have one to hand. So, for the listening test of the phono stage I compared the sound of a record deck played into the phono input with that of the deck connected via a Musical Fidelity V-LPS phono preamplifier into the line input. First up I connected my old Rega Planar 3 deck with its classic Denon DL103 cartridge. Disaster. I'd not realised that the amp would not cope with a low output moving coil. My mistake. So I switched cartridges to a Sumiko Pearl Moving Magnet model. That gave plenty of output and I was able to make some comparisons. To cut to the chase, the Lym couldn't really challenge the quality of the independent MF preamp. The Lym phono stage was OK, listenable, but it lacked the degree of detail and separation that the preamp gave the presentation. So, for example, on Joni Mitchell's live album "Shadows and Light" both approaches sounded good, especially the way both presented the late Jaco Pastorius' amazing bass playing, but a clearer treble from the MF delivered much better separation of the instruments. The Lym sounded congested by comparison. The same comparison prevailed listening to Paul Simon's Graceland album. Bass was firm with the Lym but the sound was somewhat closed in relative to the independent phono preamp. My notes continue the theme listening to some old Joan Armatrading. On her one big hit, Love and Affection, the Lym sounded fine - there was good inner detail in the guitar introduction - but the guitars shimmered a bit more via the MF. So, in summary, the phono stage sounds OK on its own terms - the music flows quite freely at decent volume and the instruments are properly presented but it does not compare with a separate phono stage playing into the Lym's excellent line channel. It's an outstanding little amp if you have sensitive speakers. The sound is relaxed and accurate with a good soundstage, delivering the goods in my small room at around half volume, whether using phono or line input. The phono stage is acceptable but not the best although it does give the amp something that few of its direct competitors offer. It's unfortunate that the RIAA circuit is not switchable. If it were, it would provide an ideal introduction to vinyl with an upgrade path available by adding a separate phono stage later (and retaining a free input for, say, a DAC). Lym do say that it is a simple process to desolder the phono card inside the unit and that they would do it for the cost of the postage if a user wanted to make the change and felt unable or unwilling to do the desoldering themselves. So. finally, I'd imagine the Lym sitting in a student set up, maybe with a basic record deck and a computer and DAC providing the inputs. For this type of application, with the right loudspeakers, it would certainly be recommended.